There was a low turnout today, as DCUSU students gathered to show their anger at rent hikes. There was a disappointing turnout at Leinster House this afternoon for Dublin City University Students’ Union’s (DCUSU) protest against price hikes for student accommodation. Barely a dozen students from DCUSU arrived late to the union’s own protest, which left several politicians and other students’ unions, which had turned out in solidarity, waiting on Kildare St for nearly an hour. Speaking at the protest, the Vice-President-elect for Education and Placement in DCUSU, Craig McHugh, thanked everyone for gathering outside of the Dáil today and said that it “was turning into a national movement”. “We have heard of students who won’t came back next year. That isn’t fair”, he said. Trinity College Dublin Students’ Union (TCDSU) and the Union of Students in Ireland (USI) were also present at the protest outside Leinster House, which was calling on the government to address the continued accommodation increases facing students year on year around the country. Students have been complaining about the problems for years, with politicians promising to address and solve the housing crisis for students, including Minister for Education Richard Bruton and Minister of State for Education Mary Mitchell O’Connor, who launched a student accommodation strategy last year. Speaking to The University Times, the President of TCDSU, Kevin Keane, said that it was important for Trinity students to “show solidarity, as we are facing the same challenges”. Despite the low turnout, Keane said that today was important, as it “continued the conversation” around the “national issue”. Acknowledging that imminent exams for students may have “hindered today’s turnout”, he went on to say that students “shouldn’t let the conversation die just because there are exams”. Outside the Dáil today a number of TDs and politicians joined the small crowd of students. Speaking to The University Times, Fianna Fáil TD and Spokesperson for Housing, Planning and Local Government Darragh O’Brien said that he submitted a proposal that would designate student accommodation as rent pressure zones. The current rent pressure zones mean that landlords cannot raise rents by more than five per cent per year for a tenancy. However, these zones have faced criticism as tenants say there is a lack of enforcement. On this, O’Brien acknowledged that there “are issues with enforcement” and said there should be further penalties, but added that “that doesn’t mean we shouldn’t add student accommodation to these zones”. Student accommodation, O’Brien said, “is incredibly difficult for people to afford” today and he said that, if implemented, the proposed bill would help students across the country, not just in Dublin. People Before Profit TD Richard Boyd Barrett also addressed students. The small-scale demonstration also saw representatives from Labour, the Social Democrats and Fianna Fáil in attendance. People Before Profit TD Brid Smith and Independent TD Mattie McGrath looked on in support, while Fianna Fáil’s Education spokesperson Thomas Byrne and Labour Education spokesperson Aodhán Ó Ríordáin also attended. Speaking to The University Times, Ó Ríordáin said a rent hike was “not good enough” and he was “very concerned about this”. He said he’d be meeting Dublin City University President Brian MacCraith in the coming weeks about the issue facing Dublin City University students. MacCraith has in the past said that student accommodation needs to be better regulated. DCUSU organised today’s protest after three of the privately owned student accommodation providers near DCU increased their prices for the next academic year by up to €1,000. 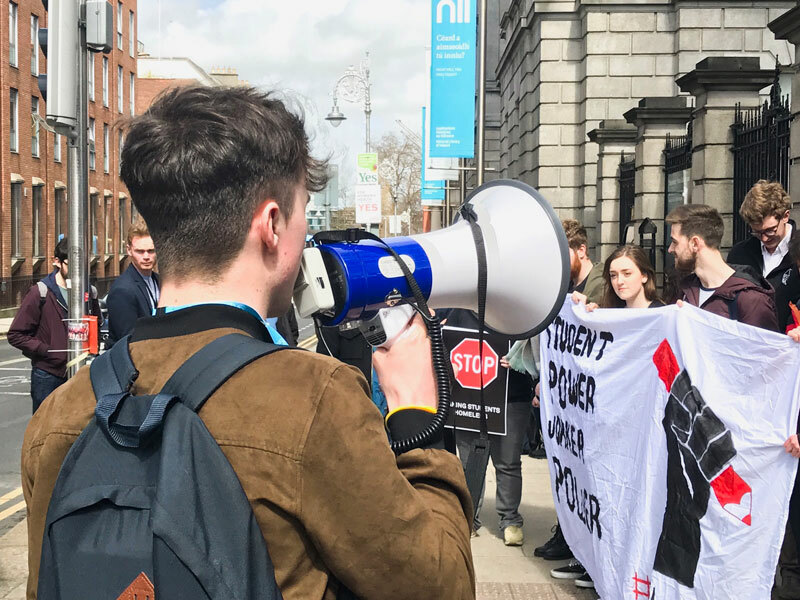 In recent weeks, Take Back Trinity has sparked a revival in student activism, with student leaders such as the President of DCUSU, Niall Behan, seeking to emulate the movement’s success.